Publisher: Avon Books, Dresden, Tennessee, U.S.A.
Don't Know Much About Geography by New York Times bestselling author Kenneth C. Davis is a fascinating and fun exploration of our planet. Geography is the hub from which other disciplines radiate: meteorology, ecology, geology, oceanography, demographics, cartography, agricultural studies, economics, and political science. In addition to presenting geographical trivia that’ll impress your friends, Davis explores 21st-century topics of global concern, including the role of the Internet and technology in transforming the lives of people around the world, how so-called developing nations develop, sustainability, and the debates over climate change and evolutionary science. 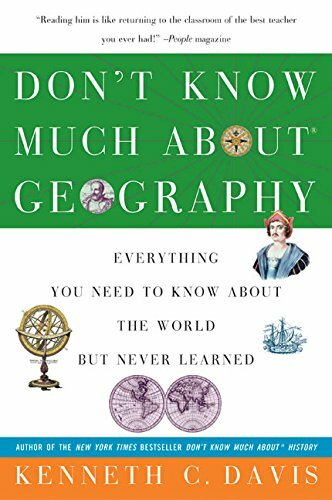 This completely revised and updated version of Don't Know Much About Geography is an entertaining and illuminating grand tour of planet Earth. Davis consistently does what your junior high teacher probably didn't; he makes geography amusing and riveting. From early concepts of whether the world was a disk floating in water (Thales) or pear-shaped (Columbus), Davis explains earthquakes, rain forests, Atlantis and whether there are canaries on the Canary Islands. In short, he covers the scientific, physical, and political history of the Earth and does his level best to raise our collective geographic IQ while entertaining us.